In recent years a number of Israeli companies, many of them staffed by former soldiers, have attempted to promote Israel as a destination for extreme tourism with a military component. Matt Carr looks at the phenomenon and considers the overlap between entertainment, voyeurism and propaganda that has transformed Israel into a military themepark. On the Golan Heights, Israeli tour operators are now taking Israeli and foreign tourists to vantage points overlooking Syria, where they can pause to take photographs and perhaps catch a glimpse of the ongoing conflict through binoculars. 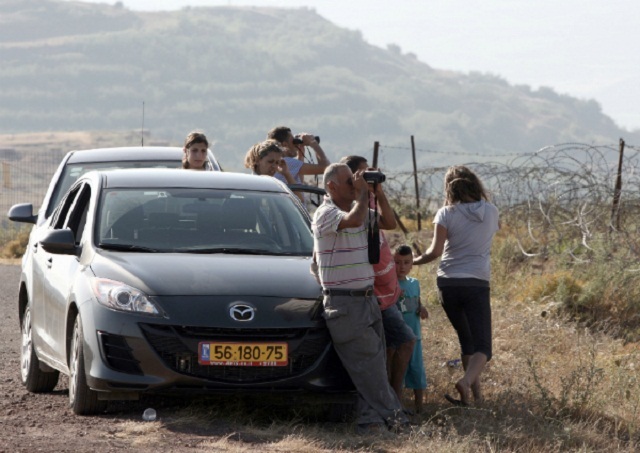 For these tourists, the Golan frontier provides a safe vantage point where they can enjoy the conflict as a violent spectacle without being physically threatened by it. Israel’s proximity to ‘real’ war and violence is also a key attraction in the military-themed tourist activities organised by Israeli companies, which have attempted to turn Israel’s military expertise into a source of profit and a vehicle for propaganda. Most of these companies have been formed by former military personnel and/or settlers, and their clients are overwhelmingly American. At the settlement of Gush Etzion near East Jerusalem, American tourists are flocking to a firing range called Caliber 3, where they charge and ‘pretend-shoot a terror operative’ consisting of cardboard targets of men wearing the Palestinian kefiyah. As in the Golan Heights, proximity adds to the excitement. According to the Israeli news agency Ynet, part of the attraction for these holidaying counterterrorists lies in the fact that the settlement is located inside ‘the Green Line’ and therefore closer to the ‘real’ terrorists. From a ‘safe distance’, clients will ‘learn about the area and the dangers of combat in such a small and fortified area’. This introduction is followed by training courses in Krav Maga, the martial arts favoured by Israeli paratroops and Special Forces, whose techniques, as the tour organisers helpfully point out, ‘can be used anytime and anywhere’. Participants might do better to learn some of these methodologies from Palestinians living under occupation, who have considerable experience in ‘coping with the impossible’and have often been the objects of considerably more extreme ‘high stress exercises’ that those offered by Lionops. In a country where many Americans regard Palestinians/Arabs/Muslims as nothing more than ‘terrorists’ to be shot and bombed, Israel’s extreme tourism enables clients besotted with war and Israeli machismo to indulge in the kind of fantasy violence that is normally associated with first-person shooter games and Hollywood films and TV series, in which an assortment of terrorist monsters are blown away by counterterrorist heroes. You can bet that it is. And in this sense the attraction of extreme tourism is not just due to Israel’s proximity to ‘the real’: it also reflects a fantasy version of terrorism and counterterrorism, in which the Israeli occupier is hero and victim and the incarnation of Jack Bauer – and tourists can vicariously participate in the great ‘war on terror’ that both the Israeli and American governments insist is being waged in both countries. Subjugated, terrorised and controlled at every level, the occupied Palestinians are dangerous and exotic ‘terrorist’ props in the transformation of Israel into a military themepark, whose proximity serves to enhance the pseudo-authenticity of a holiday experience that, as Lionops puts it, aims to be ‘as real as it gets’ but is really not very real at all. « Previous: Analysis | The Meles Zenawi Mystery: Has anyone seen Ethiopia’s Prime Minister? Who the hell to these people think they are? Really, it’s disgusting. This, among other things, makes me truly embarrassed to be an American. Mr Carrs article is one sided and carry’s an agenda of the big bad Israeli military colonizer and the poor victimized Palestinian. How far from the truth. As a survivor of a Palestinian suicide bomber on french hill, that left seven dead including a two year old girl, I can only say thank god for the Israeli military machine that without it we the Jewish people would have been driven into the sea long long ago, but hey maybe that’s something you haven’t considered , or have and like the idea of . So if you have history twisted and think murderers are freedom fighters all the credit to you. In the mean time if somebody wants an adrenalin rush from training alongside real life heroes in order to get an insight into their skills and how we can hold on to our Jewish national eternal historic homeland whats wrong with that.